The delicious cocktail has been on my favorite list for almost 7 years. Steven and I found the recipe for it when we were researching classic, turn of the century cocktails for our Speakeasy themed wedding reception so it’s an oldie but a goodie! And these days, I see it all over Seattle at chic bars and restaurants which is awesome! It’s one of those cocktails that goes well with a lot of different food and snacks. If you like cherries and either scotch or bourbon this is a must try for you. Be sure to only use Heering though—other cherry liqueurs just don’t taste any where close to it in my opinion. Pour ingredients into a cocktail shaker filled with ice and shake vigorously. Strain into a champagne couple or martini glass for a classic look. 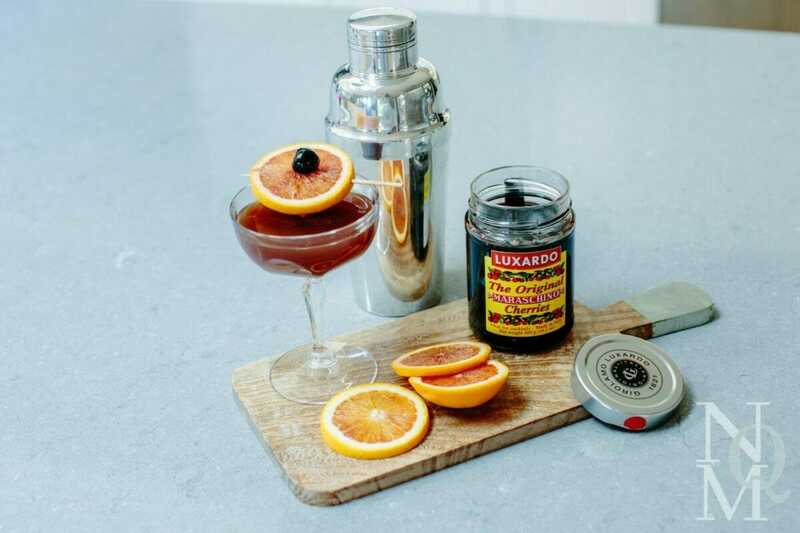 Garnish with Luxardo Cherries and/or round slice of a blood orange. There are many types of artisinal sweet vermouth brands these days. Try a few to see which appeals to you most; we love Lustau brand the best. When choosing Scotch, it’s best to avoid peaty varieties. Our preference for Scotch in this recipe is Glenfiddich or Dalmore with a very close runner up in a more wallet friendly range is Bird Dog Whiskey. Luxardo Cherries are pricey but so worth it as it is a not from concentrate or fresh squeezed orange juice. If you like the idea of having champagne coupe or cocktail glasses, check out thrift stores and antique malls for bargains. We have a mixed collection of many patterns which is both fun and functional (guests know which glass is theirs even at larger parties).